Made with a state of the art UV stabilized acrylic high performance refractive optical assemblies that use high transmicity materials to achieve precise photometric distributions. Available in Type II, III, IV, IV Automotive, Automotive Frontline Wide, IV Tennis, V Narrow, V Medium and V Wide beam configurations. Optics may be ordered rotated 90 degrees for perimeter lighting or walkway applications (optics are not field rotatable). 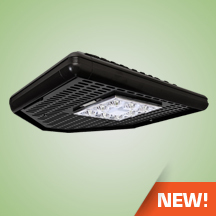 The full cutoff fixture is Star Light Friendly (meets or exceeds Dark Sky requirements) in the horizontal position. Available in up to a 8 brick LED system in 5000K-70 CRI Cool White (+/- 500K) or 4100K-70 CRI Neutral White color temperatures propagated with CREE® XLamp XHP70 LED’s. Consult factory for high CRI (90+) model availability. Available with 100-300V 50/60 Hz Class II power supply. LED’s rated for over 50,000 hours at 25°C ambient temperature. 347V~480V input option available. 0-10V dimming. Built-in surge protection up to 10 kV. Built-in Active PFC Function >95%/Full load. LED Power Supply conforms to UL8750 standards and is IP65 rated for wet locations. The fixture is designed to mount directly to a square pole. An adaptor is available for direct mount to round poles. Techlight’s Quick Mount Bracket for flush mount or the Quick Mount Bracket with various arm lengths also available. All mounting options allow the Tapered Back Dagger to mount at 90 degree intervals.